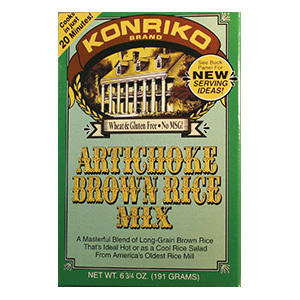 America’s finest brown rice blended with the delightful flavor of Artichokes is sure to be a family favorite. Try it steaming hot to accompany a main dish or for a completely change of pace, serve it as a cool, refreshing salad on a hot day. Perfect as a side dish to grilled fish, baked chicken, pork chops or your best Sunday dinner pot roast.